PhpStorm 2016.2, the second update for PhpStorm this year, is now available for download! Read all about the new features and improvements on the PhpStorm website. Better PHP Language Support: Improved type inference, strict type inspection for PHP 7, better parsing of PHP 7 and PHP 7.1, and improved getter and setter generation for PHP 7 (and higher). New Editing Experience: Dynamic live template for smart completion of function parameters; values of class constants shown in completion lists; possibility to filter out static methods from completion list; smart type code completion; and various @throws improvements. Code Quality Analysis: Reworked Unused imports inspection for unused namespaces, functions, and constants; Return type inspection; and Dynamic call to static method inspection. Frameworks, Tools, and more: Template projects, better Joomla! support, and Xdebug On Demand for CLI PHP Scripts. Please see our issue tracker for the full list of PHP-related issues fixed and release notes from the previous EAP build. In addition, Database tools have been improved, compliments of our colleagues on the JetBrains DataGrip team. For more details please see What’s New in PhpStorm 2016.2 and download a free 30-day PhpStorm trial for your operating system. PhpStorm 2016.2 is available as a free update for everyone who has a active subscription for PhpStorm or All Products! This entry was posted in Release Announcements and tagged PhpStorm 2016.2. Bookmark the permalink. Simply invoke completion twice to get static methods. If completion list appears automatically during typing you need to press Ctrl+Space to see more variants. 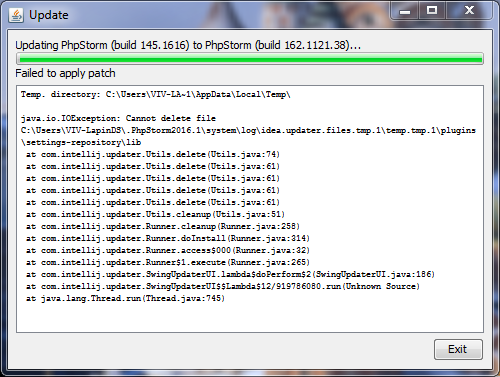 In the meantime, I’ve downgraded back to last year’s version of PhpStorm, which at least works. Please, add short PHP tag inspection! This was released as a patch update, so I installed it, now it says my PERPETUAL license key is expired and I can’t do my job. If you’re going to make me pay for an update, the software needs to make that clear when offering it. You just cost me half my day. This happened to me too. And I was never notified by the software that my license was running out or else I would have paid to renew it. But now I would have to purchase a new license. Just going to have to use 2016.1.2 for now on. @c4marcus:disqus did you also have perpetual license or some other type? We are trying to figure out all the cases so we avoid the confusion for the next time. Hmm, why does my phpStorm say I have the latest version when I try to update but really I have 2016.1.2? Please try to invoke dialog manually via ”Help->Check for updates”. If this doesn’t help please create a new issue at https://youtrack.jetbrains.com/issues/WI because it’s very likely a configuration specific issue since a lot of customers receive update just fine. No difference and I tried that before posting here. I created an issue. or just uninstall your old phpstorm preserving all the settings. Then install the new one. Please copy your PhpStorm2016.1 folder into PhpStorm2016.2 (see https://intellij-support.jetbrains.com/hc/en-us/articles/206544519-Directories-used-by-the-IDE-to-store-settings-caches-plugins-and-logs). Does it help? Hi I can’t create new project from samba share. After downloading files nothing happens and Phpstorm doesn’t open new project It just sits on welcome screen. I can’t reproduce the issue so far. Could you please create a new issue at: https://youtrack.jetbrains.com/issues/WI and attach idea.log (Help->Show Log in …) there. I installed php70 and php70-xdebug with homebrew then removed the xdebug ini file from conf.d. Anyone else seen this issue in phpstorm? That is very likely not connected to PhpStorm and it’s just an issue in XDebug or PHP installation. and coverage works again. Same solution works for running phpunit command line. This just started happening in a CakePHP 3.2 project. I’ve been running with code coverage all day, but after I updated a dependency I now get the above message when running the coverage report. Plain phpunit works fine, both as command line and from inside PhpStorm. Yeah, same here, have you found a solution? And you find a solution? Guys, where is “Tools->Deployment” button? Please check that “Remote Host Access” plugin is enabled in “Settings->Plugins”. oh, i disabled it by myself. shock! Thanks! The project names in the “Welcome Screen” are not displayed any more since the update. Only the full path to the project is displayed twice. Please release the update – this issue is very annoying! Why can’t I update from the IDE, and have to download and install hundreds of megabytes (yes, hundreds – if you consider what’ll land on my disk uncompressed – which is 500+ MB) again? There should be an update from PhpStorm 2016.1.2 and from the latest EAP. Which version do you have? XDebug on local Apache stop working after upgrade. Can’t figure out why. How do I revert the font change? How can I get the latest update from the existing installed phpstrom… I am not getting the option in the following window. How can I update phpstrom not downloading the new version? Why can’t the app auto update and stop changing installation paths on every version?! Very frustrating. Agreed. These aren’t “major” version changes, these could easily all be in a “minor” version that updates in the background and only requires a restart, not a full reinstall which has broken our imported settings before, and now they’re doing it 3 times a year. I think they just haven’t figured out how to do minor version updates in the background yet. The 2016.2 upgrade was a disaster. PhpStorm “forgot” my licence and all of my IDE settings. Databases? What database? 20 servers and connection settings gone! I have come to expect a little more from jetbrains, let’s setup the QA process on these upgrades before we do that again. I updated from 8 to 10 and half of my settings were lost on import (from the exported file). I haven’t updated since, yet I sometimes I have to ask questions on the forums… for an old version. Presumably still no support for remote debugging of apps using Composer?